However, we understand that below the level of "classic coeliac" are various levels of gluten intolerance, from those people that suffer physical annoyances to those folks commonly referred to as "pain in the arse fad followers". However, given anyone on that scale (excluding the classics) is still a potential beer drinker, they are being catered for on a greater, albeit niche, level by a small number of craft brewers here and abroad. 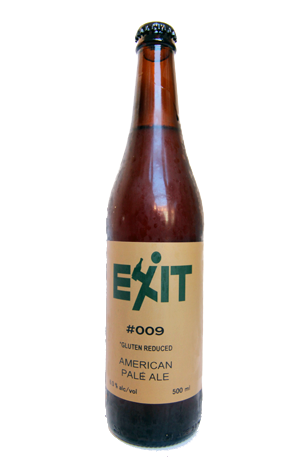 The way in which Exit has turned this APA into a beer with a gluten level of less than 1.5 parts per million (which we're assuming is damn low) is by the use of a magic enzyme that takes great joy in hunting down little Vladimirs and annihilating them. Thus, there's no need to ditch malted barley and replace with the likes of sorghum and millet. Rather you brew as you would then let the enzyme go to work retrospectively. The result here is a relatively light-bodied, pale ale with citrusy, piny hops and a light biscuit base.